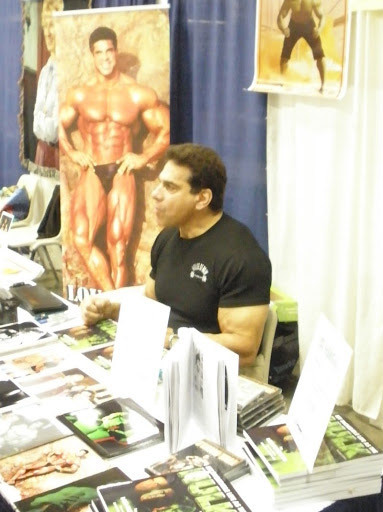 Lou Ferrigno at some convention, with a table filled with his own stuff and Hulk stuff but no HERCULES material in sight. I know those HERCULES films weren't great but they still helped him stay in the spotlight. Ferrigno went to a Swedish convention, which I couldn't attend. However, a friend of mine went and brought the cover for my double bill DVD of Ferrigno's Hercules films. He snapped a photo of Lou holding up the signed cover. Apparently he said that it was probably the first time he ever saw someone bring Hercules-related material to be signed, and he seemed quite pleased about it. Cool story! It's hard to believe few people know about it. Thanks.